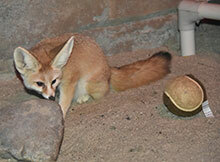 The Zoo has two new fennec foxes in Small Mammals—an adorable pair named Bonnye and Clyde. Bonnye, who is five years old, comes to us from the Phoenix Zoo, while seven-year-old Clyde came from Happy Hollow Park & Zoo in San Jose. Zookeepers report that the two seem to be getting along very well so far, even sleeping right next to one another despite having a roomy three-exhibit area to share. Clyde is a bit on the shy side, while Bonnye is feisty and very curious. Zookeepers are currently doing positive reinforcement training to get the foxes acclimated to their new environment. This is breeding season for fennec foxes, so it is possible that we may be welcoming fox kits if Bonnye and Clyde breed—but that, of course, is up to them! The gestation period for fennecs is only 50 days long, and there are typically two to five kits in a litter. 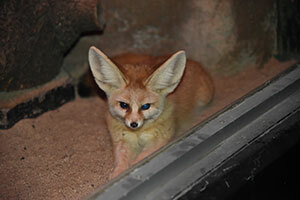 Fennecs are found in arid deserts throughout northern Africa to northern Sinai. Their population is relatively stable at this time; however, increased human development in certain areas is threatening some populations. Fennec foxes currently have a Species Survival Plan® (SSP) through the Association of Zoos and Aquariums. The fennec fox is the smallest canid – or member of the dog family – in the world. Weighing only around three pounds, fennecs have oversized ears that not only give them an acute sense of hearing, but also help to dissipate heat in the desert climate they inhabit. The fennec fox is nocturnal and generally stays underground in burrows during the day. It ventures out at night to hunt in cooler temperatures, feeding on rodents, insects, scorpions, lizards, berries and leaves. In the desert, fennecs have adapted to rely on food sources to meet their water needs. Visit the Small Mammals building on your next trip to the Zoo to meet Bonnye and Clyde.